In Robin Hood: The Return of Richard, the fate of the people now lies in your hands. 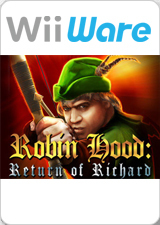 Help Robin Hood to defeat the villains and restore peace! While Richard, the true King of England, is absent from his throne, his country rages in chaos. England has been invaded, and enemies burn and destroy local towns and villages. After the house of expert archer and hunter Robin Hood was burned down, he, together with a group of free archers like himself, hides in Sherwood Forest and begins his fight for justice. The fate of the people now lies in your hands. Help Robin to defeat the villains and restore peace in this shooting game! The graph below charts the compatibility with Robin Hood: The Return of Richard since Dolphin's 2.0 release, listing revisions only where a compatibility change occurred. This page was last edited on 15 January 2018, at 02:09.